At the end of last year I suggested some ways to start saving in 2015. Now we are into February the bills for Christmas have arrived and for some people a real financial shock. I realise for many it is not about saving but dealing with debt. As a former financial adviser I have never had debts apart from my mortgage but I know how easy it is get into financial problems. 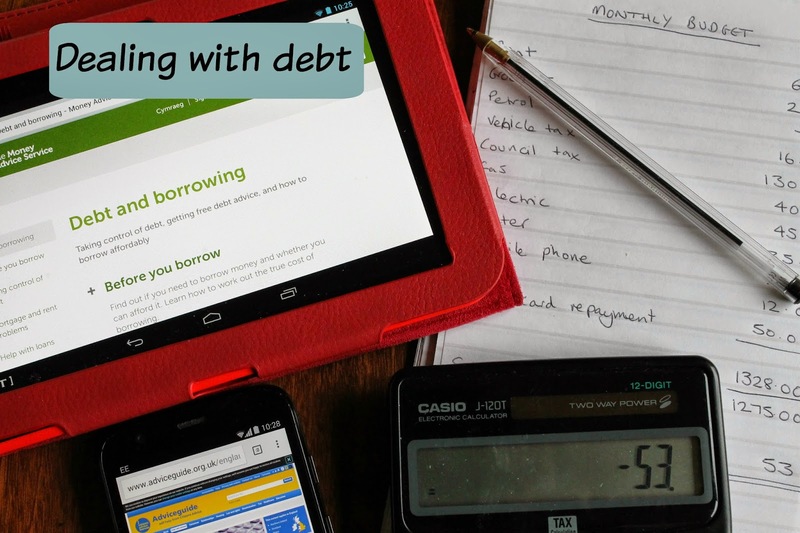 There are two basic ways people fall into debt – either through overspending on things they can't afford or a change in personal circumstances such as redundancy, illness or death. However your money troubles have occurred here are some ways to start dealing with your debts. Don't ignore them – The most important thing is to start sorting things out. Don't shove unopened envelopes into a drawer. Sort out all your paperwork and make a full list of how much you owe and who to. Once this is done sort them in order of priority and what needs paying first. Mortgage and rent payments should come first because if you don't pay these you could become homeless. Contact your creditors – These will be the people who have lent you money in form of credit cards, mortgages, finance plans for cars etc, or bills you need pay such as your gas, electric and water. Whatever way you do it from writing a letter, emailing or phoning it is also best to get in contact to say you are having trouble paying. They will respond better if they know you are trying to sort out your debts rather than ignoring them. Some will be to sort out more affordable repayment plans. Stop spending! - It really is a case of needs not wants. If you buy something only because it is reduced you are simply spending money and not saving it. Say no to new clothes, nights out, expensive hair cuts and any other expenditure which isn't required. Cut up credit cards and start paying for items with cash. Work out your monthly expenditure through an online budget calculator such as this one from the charity Shelter. Reduce your outgoings – Try to lower monthly bills such as mobile phones, TV and broadband and utility bills. Mobile phone contracts can be very expensive. Do you use all your monthly allowance? Try to swap to lower tariff. All televisions have Freeview now so cancel any satellite or cable contracts. You can only watch one channel at a time! Check for deals on broadband and see if other providers are cheaper. Reduce your fuel bills by turning down heating and switching off lights and appliances. Check your tariff to see if you can switch to a cheaper one. Try comparison a site such as uSwitch to see if you can get a better deal. Mortgage repayments – If you don't keep up with your mortgage repayments you could lose your house. You can lower your monthly repayments by getting a lower interest rate. If you are on the Standard Variable Rate (SVR) will will be paying one of the highest rates. Usually the best rates are decided by the Loan To Value (LTV). This is the difference between your mortgage amount and how much your house is currently worth. For example if your mortgage is for £100,000 but your house is worth £200,000 then your LTV is 50% (£100,000/£200,000 x 100). Do check if the lender requires an upfront fee as this could wipe out any potential savings. Check credit card rates – Many debts are run up very easily through overspending on credit cards. Typically the interest rates on these cards are usually around 15% to 30%. If you have a large balance on credit cards then a high interest rate could mean you are simply paying off the interest each month rather than reducing your original spend. Try to transfer your balance to a credit card with 0%. Beware though that some cards have a balance transfer fee. Don't think that a 0% interest rate means you don't have to make any repayments though. In order to qualify for the rate you will need to make at least the minimum repayment each month otherwise a higher rate will be imposed. Use savings to pay debts – Savings interest rates are rubbish at the moment. Keep some money aside for emergencies and unexpected bills but don't be paying high interest rate for debts if you have money in the bank. Check your benefit entitlements – You don't need to be on a low income to be entitled to government benefits. You can be employed or unemployed, have children or no children or be retired. Even if you earn up to £72,000 you could be entitled to financial assistance. Don't turn down money that is due to you. Check the calculator on GOV.UK to see if you are due anything. No to more loans – Don't try to pay off debts by taking out more loans. The interest rates on 'payday' loans are extortionate. Even if it is for a couple of days taking out a payday loan could mean you are turned down for future mortgage agreements as lenders are seeing these loans as a form of bad credit. Consolidation type loans will also end up costing you more money and could extend the amount of time it takes you to pay off your debts. These are offered by companies who need to make to a profit so will charge arrangement fees and could charge higher interest rates than what you are currently paying. Don't gamble it away – Buying lottery tickets, gambling on sport, playing online poker or bingo will not make you enough money to pay off your debts. Many peoples' debts are caused by an addiction to gambling. Big lottery wins are very rare. A small win through gambling will get you sucked in to believing if you gamble more and more you will win more. Sorry, but the 'house' always wins in the end. Sell, sell, sell – Everyone has stuff in their house which they can sell in order to make money. For most things you won't get back what you paid for them new but it will bring in some money. Try your luck at car boot sales, Gumtree, Facebook local selling sites and of course eBay. Make sure with eBay you take into account selling charges and postage costs so it doesn't end up costing you to sell. If you have books, CDs, DVDs and console games try sites such as Zapper, Ziffit, Music Magpie, WeBuy DVDs and We Buy Books. If you have baby and toddler clothes and equipment these can sell well at NCT sales. Some great tips - and I've always been a fan of ebay to 'recycle' stuff we don't need anymore. Really great advice love - I've been there in skint land and it can be incredibly scary and/or know where to start. it's very tempting to just stick your head in the sand and pretend it's not happening.